USER SCORE:100%The percentage of users who liked this based on high quality reviews from sources such as Google Play, iTunes, and Amazon Music. Above 75% is green. ? 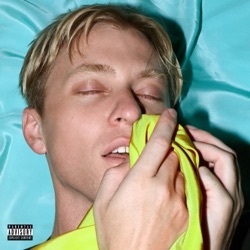 Brutalism is the fifth studio album by The Drums, released by Anti on April 5, 2019. The ping-ponging keyboards and chiming guitars of Body Chemistry suggest New Order coyly dancing with the Smiths at the Hacienda. A late thirties on self-discovery, musical and human. It’s entirely possible that Pierce chose to use this formal LP as his scratch paper for working through frustration, and that Brutalism is simply the type of album made for its own creator above all. Brutalism is undoubtedly the best collection of tracks the band has released. It’s personal, honest, yet still demonstrates upbeat experimental sounds while being cemented with good pop intentions. Brutalism contains some of Pierce’s most honest lyrics and is more varied musically than their previous output. Brutalism is quite possibly the best collection of songs in the band's ten-year career. A welcome return from a band, and artist, who always had more to give and more ground to cover – and hearing him deliver on it is a joy to behold. The Drums’ fifth and maybe their best. Brutalism is exactly what it purports itself to be; simple in sentiment, at times harsh and impenetrable, and internally soft and loving. Jonathan Pierce is The Drums and as happy as he had not been with it for a long time now. Brutalism just goes to prove pain and separation really does make great fodder for terrific music. His infectious tunes pave a scenic path through relationships and their ever-changing dynamics. Pierce's fifth full-length tackles self-care in a beautifully honest way. Brutalism is a gorgeous album that provides both joyous peaks and heartbreaking lows. Much of the record feels like a delicious throwback to the mid-aughts, from the burbling dance-rock of Pretty Cloud to the chirpy clatter of melodies on Kiss It Away. Brutalism, might be his boldest and most purely-pop statement to date. The Drums is still Jonny Pierce and Brutalism finds him still getting brutally personal. This is an album that can be enjoyed on many levels, immediately and with lasting effect. Brutalism is The Drums’ work we’ve long been waiting for. If you want to recreate Brutalism, turn on the menu screen of any Sega Genesis game from 1992 and read aloud your angriest poem from high school. Perhaps the first album in The Drums' catalog that feels primed for a dance floor rather than a bedroom. Brutalism reflects a time of transformation and soul-searching.